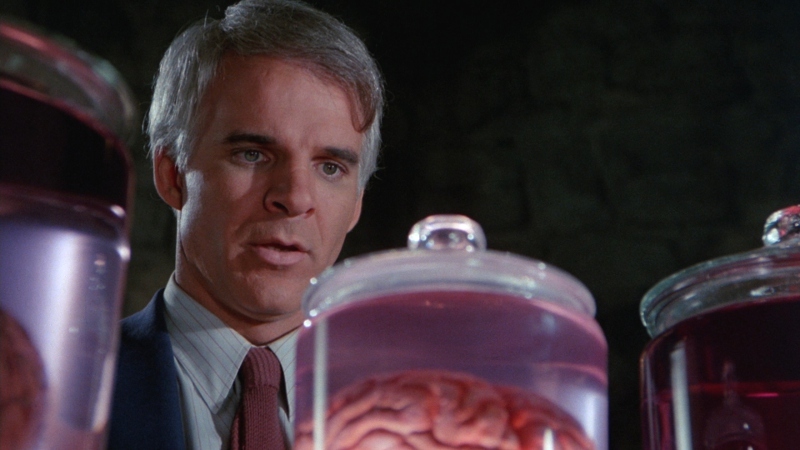 A lighthearted and silly spoof with no shortage of great one-liners, Carl Reiner's The Man With Two Brains (1983) is one of Steve Martin's best films and their third of four collaborations. Co-written by Martin and Reiner with George Gipe (who worked with them on Dead Men Don't Wear Plaid but would tragically die just three years later), our story follows the complicated love life of renowned brain surgeon Dr. Michael Hfuhruhurr (Martin). He's seduced by gold-digging patient Dolores Benedict (Kathleen Turner) after her successful surgery and they're joined in marriage, immediately prompting a convenient string of headaches that keep Dolores out of the bedroom for several weeks. 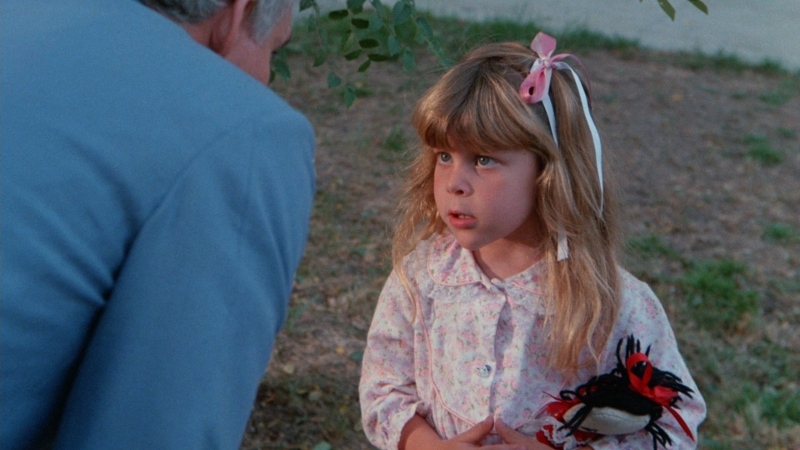 Eventually, the Hfuhruhurrs travel to Vienna for a medical conference where Michael meets fellow brain enthusiast Dr. Alfred Necessiter (David Warner), whose experimental methods enable him to keep brains alive in liquid. Dr. Hfuhruhurr quickly becomes attracted to one after discovering he can communicate telepathically with her (it? ), struggling to balance his feelings between an uninterested wife and a dream girl with no body. Our two doctors eventually decide to transplant the brain (named Anne Uumellmahaye, and voiced by an uncredited Sissy Spacek) into a permanent home, with Dolores being just one of several candidates for a radical procedure that has yet to work. Jokes come fast and furious during The Man With Two Brains, and most of them still stick more than three decades later. The film's inspired script is bolstered by great performances from top to bottom, with Martin and Turner doing most of the heavy lifting; they play exceptionally well of one another, in sickness and health, while David Warner's welcome presence as Dr. Necessiter easily captures the bronze. Like a lot of Martin's other films, The Man With Two Brains doesn't exactly hide its influences---perhaps none larger than Monty Python's Flying Circus---yet still manages to leave its own stamp on the genre, also thanks to director Carl Reiner's light touch and a memorable score by the late Joel Goldsmith. Yet its greatest achievement might be the ability to deftly switch tones multiple times, as the second-half romance between man and brain gives Reiner's film much more of a heart than first-timers might expect. 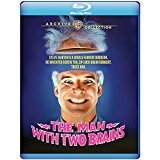 Warner Archives' new edition of The Man With Two Brains continues a great month for Martin films on Blu-ray, which also include My Blue Heaven (also out 8/29 from Warner Archives) and the Best Buy exclusive Bowfinger (wide release 10/10). It follows the studio's own 2014 DVD with an outstanding new A/V presentation, yet the lack of bonus features is still disappointing. But The Man With Two Brains is a great example of no-frills catalog treatment done right. There's a lot to like about The Man With Two Brains on Blu-ray, as Warner Archives' new 1080p transfer easily runs circles around their own 2014 DVD. Sourced from a brand new remaster of the film, this Blu-ray features an extremely stable and well-balanced picture overall, and one with no glaring defects along the way. Image detail, color reproduction, black levels, and contrast are all much improved, as are texture and film grain. There are an awful lot of varied locations on display here: bright sunny days, hazy interiors, neon-infused laboratories, dangerous elevators, dark city streets...and this disc easily handles every environment from start to finish. Not surprisingly, it offers the film's definitive presentation to date: accurate, striking, and polished, this Blu-ray will impress die-hard fans and newcomers alike. DISCLAIMER: The promotional images on this page are strictly decorative and do not represent the title under review. This Blu-ray's DTS-HD Master Audio mix splits The Man With Two Brains' original one-channel audio into a 2.0 spread with clear dialogue, effects, and music. Though limited in dynamic range by its source material, this is still a very competent presentation that I'm glad wasn't given a faux-surround remix. Joel Goldsmith's memorable score sounds especially strong at times, making its presence known without sounding overcooked. Optional English SDH subtitles are included during the film, but they're garishly printed in ALL CAPS like a few other recent Warner Archive discs. This disc arrives in a standard Blu-ray keepcase and includes cover artwork identical to the menu; both are similar to the film's iconic poster artwork. The static interface includes an option to toggle the subtitles, along with and option to view the film's Theatrical Trailer (the only extra, unfortunately). Originally advertised as a "remastered" trailer, it doesn't look like much work has been done here and it's not even advertised on the packaging. The Man With Two Brains was a hard film to pass up during its original run or in the days of mom-and-pop video stores: die-hard fans of Steve Martin were likely drawn in by name value alone, while the film's memorable poster (and eventual VHS/DVD artwork) undoubtedly grabbed the attention of casual shoppers. Either way, it remains an infectiously fun and creative comedy with fine performances, a lively score by the late Joel Goldsmith, and plenty of replay value due to the volume of great one-liners and memorable moments. Warner Archives continues a great year for Martin's films on Blu-ray; while the lack of bonus features is extremely disappointing, its top-tier A/V presentation is the real selling point here. The Man With Two Brains is firmly Recommended for established fans and first-timers alike.